Oh I can feel it is Christmas time. I can see feel it in the air and see it in my favourite products. Well, today I wanted to dedicate a post to these amazing Charlotte Tilbury products I received in the post yesterday. 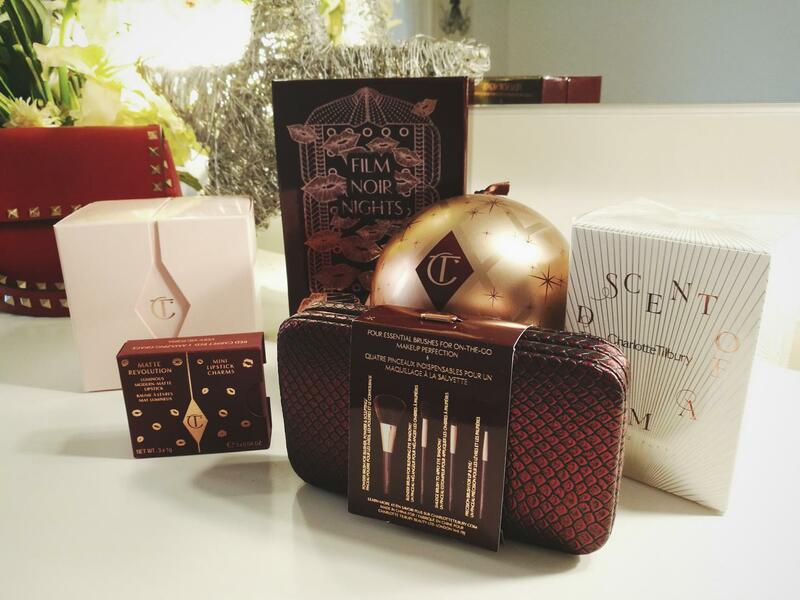 I am so happy to be partnering with Charlotte Tilbury on this festive time of the year! As any girl goes I like makeup and pampering myself, so I got myself a Christmas treat and I am so amazed by them that I am sharing it with you guys. First of all #CTlegendaryparties goodies came beautifully packed. Each product has an amazing look and feel to it. It is all designed to make Christmas come alive and they are simply gorgeous and would look amazing under the Christmas tree! First off – these cute mini Charlotte Tilbury matte revolution lipstick charms. They are the size of you pinky finger. Lipsticks come in three amazing matte colours with little string on top. You could hang them on a christmas branch as a cute decoration – but most importantly – they are actually amazingly pigmented and long lasting. Colours go from brighter red to deep brown and they are very trendy and sensual, perfect for the upcoming events and celebrations. Small in size they are perfect to carry around as they do not take up a lot of space and could fit in your wallet without taking up too much room. They come in this velvety brown purse, to keep them all in one place, but also to make sure they don’t go everywhere in your bag. Inside there are four brushes. 2 for your eyes and 2 for your face. They are also made small enough for you to be able to carry them around without taking up too much space. I especially like the smudge brush as it has done wonders for me! You will be able to see what I did with it in my future posts. I intend on playing with these a lot! Charlotte Tilbury’s Legendary party eyes Christmas ball is perfect! You can hang it on a Christmas tree and surprise someone with it! Inside a lovely mascara pocket sized, accompanied by an eyeliner. Both are protected by the tissue paper to make sure your products arrives to you undamaged. The mascara had a nice dense brush making sure your lashes get the nice natural length and volume they deserve. Also able to fit your wallet , purse or pocket! Next in line is this amazingly packaged Charlotte Tilbury magic cream. And it is simply magical! The box is a pleasure to open and it is quite an experience reaching the product. Coloured light pink, it is a very girly product dedicated to all the queens worthy of pampering. The jar is amazing! It is actually so lovely I didn’t want to open it. One of those things that looks beautiful in your bathroom even after it is used! Now a product that left me speechless! The box on the outside looks like any other box. But when you open it you will probably have the same reaction I had! Yes,! The box has its own mirror and lights! How amazing is this? I had to run to my boyfriend and show him, even he was impressed! I was so stunned by it I forgot there were products inside ha-ha. Of course inside is another lovely Charlotte Tilbury lipstick this time in regular size , accompanied by a lovely shade of KOHL liner. Find this amazing kit here. Last but not least, a feast for the senses. A lovely Charlotte Tilbury perfume. Again – lovely packaging and an even more amazing bottle. It is almost like a love potion. Does it not remind you? The scent is quite strong and feminine with a citrusy hint. A perfect gift for a girl of classy taste. I am sure to take this lovely thing around with me. I am so excited to use these products in the upcoming day and sharing what I come up with. Please stay tuned for some of mine Makeup tutorials I will be doing in the upcoming days, I will make sure the products are reviewed in details but also it will give a good impression off what they look like in the video. In the meantime you can find Charlotte Tilbury products on Instagram and on their website.